Today’s my wedding anniversary. Three years married to an amazing man—and life partner of twelve years. This was definitely among the best decisions I’ve made in my life. But this post isn’t exactly about that. See, three years ago also happened to be the culmination of my control tendencies, and while I didn’t quite realize it at the time, they created an overwhelming amount of unhappiness and dissatisfaction in my life. I never thought things would unfold that way. Now, you may have gotten to this point and think this is one of those bridezilla stories. It’s not. It might actually be the opposite. Kind of. See, my wedding was actually very far from being traditional. My partner and I had talked about it for a while, but really in the realm of “we should make an appointment at city hall and sign the papers” kind of way. We already knew we were committed for life. But covering our asses legally seemed like a good plan too (because kids and houses and such). As it turns out, this conversation was also happening between my husband’s two brothers and their respective long-time partners, and when we all realized this was the case, we came up with this crazy plan: why not get married all at the same time, and make a big party out of it?! Because that can’t possibly be complicated, right? Now, at that particular point in my life, I was feeling pretty lost, purpose-wise. I’d had the kids. I’d bought the house. I was desperately searching for what was next, and couldn’t figure out what that could be. So when a project of that magnitude came under my radar, you can absolutely bet that I jumped on it! It seemed like such a natural fit: I happened to have professional event-planning experience, I had some time on my hands as I was home with a baby and days just seemed to drag, and more importantly, it could give me a renewed sense of direction: I would organize the best smallish-low budget-ish but very cool-triple-wedding EVER! Over the following months, I had to learn to care about things that had never been on my radar before—seating charts and centerpieces, anyone?—which may be what most people organizing a wedding go through, I suppose. 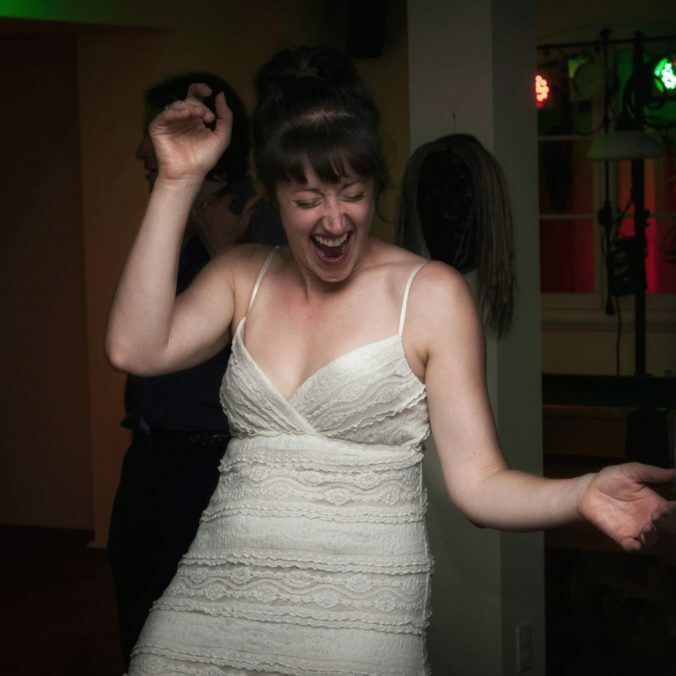 Clearly, this actually being my second wedding didn’t make me more prepared to deal with it. I also had to get crafty, as we were DIYing a lot of details, and which to me can be kind of a nightmarish scenario, as I can have strong perfectionist tendencies (especially then, I’m in recovery now) and am notoriously bad at asking for help. But I did it (and can now legitimately add silk paper flower making to my skill set). Even though I was a little annoyed, I pretty much stayed silent through the whole process (see above paragraph about not asking for help). Still, I couldn’t help but wonder: why couldn’t others get with the program? Didn’t they realize that I was doing all of this for them? People wavering about certain decisions made me roll my eyes until I had cramps, and other’s emotional reactions—because that obviously never happens in the context of a wedding—felt completely unreasonable to me. Basically, I was expecting everyone to approach this project the same was I did. And that was my absolute downfall. I watched the rest of the party actually relax into their wedding weekend while I felt like I was still scrambling to “make things happen”. I did not enjoy myself. Ultimately, it did happen. Lots of tears were shed—during the ceremony, which I consider to be a very good thing, especially since they were combined with a lot of laughter—and we all got to say “yes” in front of our close friends and family. During the whole thing, I was frazzled and annoyed. I felt like many others hadn’t stepped up to the plate (some did, though, and spectacularly so, and I will be eternally grateful for them). Afterwards, although I’m really not proud to admit it, I harboured a good measure of resentment. It took me some time, and even more work, to finally have the courage to rework that story. Expecting others to react to any situation—positive, negative or neutral—in the exact way that we do is completely unrealistic! After all, if we want others to recognize our autonomy to make our own decisions, to have our own process and to feel our own feelings, we kind of need to grant them the same. Yet we tend to struggle with that last part. By trying to control every variable in a situation, including other’s actions and reactions, we are setting ourselves up for serious failure and heartbreak. And while we may ultimately grow and learn for this type of failure, there’s a good chance that we’ll cause tremendous pain—both to ourselves and to the ones around us—if we don’t wake up to what’s really going on. Communicating clearly about our expectations is one thing, certainly. But even if we do, we have zero control on how others will respond, nor should we want to have. And if those expectations aren’t met, we are still fully responsible for our response. Feeling disgruntled? That’s a choice. It’s 100% on us. In the example that I illustrated above, my annoyance was entirely my problem. I ultimately made myself miserable by holding on to it, when I could have recognized that every one else involved had a right to experience the whole situation in their own way, on their own terms, and with their own reactions. I could have moved on. The fact that I stayed stuck for a long time in a self-serving story isn’t something that I’m proud of, but ultimately the important part is that I was able to rewrite the narrative, give everyone else the space to do their own thing, and recognize that we were all doing our very best in an emotionally charged context. This is a story that ends well, regardless of my original sentiments. Now, I recognize that being told that we’re wholly responsible for our own adverse responses can come as a bit of a shock when we’re not used to looking at things this way: we often feel justified in our negative reactions, without realizing that we’re basically poisoning ourselves. Does that mean that we can’t ever feel disappointment and anger? Of course not! But clinging to them as if they were our birthright will never serve us. Instead, we can actually choose to acknowledge how we feel, recognize that the only thing we can control is our reaction, respond accordingly, and move on with our life. How do you feel about this? I’d love for you to take a minute and tell me by commenting on this post, or writing to me at info@balanceperformance.ca. Eyes On Your Own Plate! Wow… This hit me hard in two areas! One, because I am planning my wedding now and super stressed about it, and two, because I am definitely in the habit of trying to control and do everything and getting mad when I don’t get the reactions I expect. Thank you for sharing, helping me realize I am not the only one, and giving me a new perspective on it! Well done. I have really worked at this over the years. It takes a lot to let go when our expressed expectations aren’t met. I like the saying, “Resentment is like poison and expecting the other person to die.” It serves no purpose other than misery. And as you said, you choose wether or not to hold on to it, let it go or even to pick it up again. Thanks for your vulnerability. Sharing family stories and stories like these can be scary. Happy Anniversary.